George Noakes was born in Robertsbridge, Sussex in about 1894. It would appear that his mother died when he was very young and his father remarried. His mother had about six children, and his step mother, a further four daughters. He also had a step brother. In 1911 he was living in Hawkshurst and working as an apprentice grocer. At the time of his death he was living in Myrtle Road, Dorking. He was unmarried at the time of the 1911 census and no marriage of anyone of the same name was recorded in the Hawkhurst or Dorking area between 1911 and the time of his death in 1915. The Dorking Advertiser reported his death. 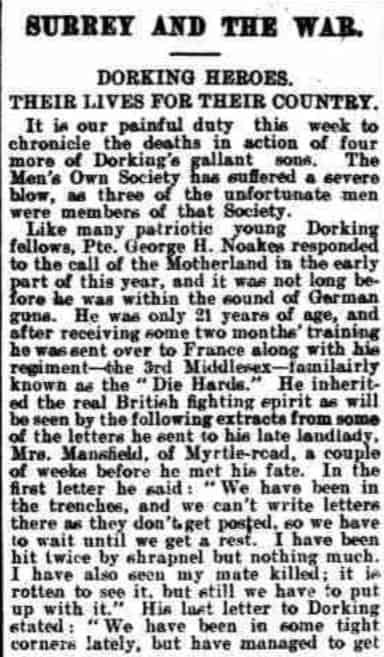 “It is our painful duty this week to chronicle the deaths in action of four more of Dorking’s gallant sons. The Men’s Own Society has suffered a severe blow, as three of the unfortunate men were members of that Society. The young hero’s desire was not to be, for he was killed a few days afterwards. 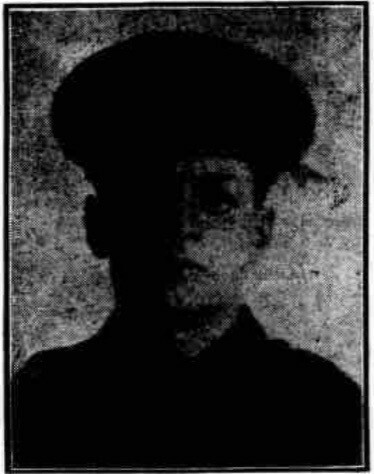 He is commemorated on the Menin Gate, Ypres and there are no details about his family. The Battalion that he had joined was stationed in India prior to the outbreak of war. They came back to Europe and were deployed to the Western Front in January 1915. They fought in the Second Battle of Ypres, where George Noakes was probably killed, and the Battle of Loos. Later that year they were redeployed to Salonika.